The awards will be presented at the White House on November 22nd. 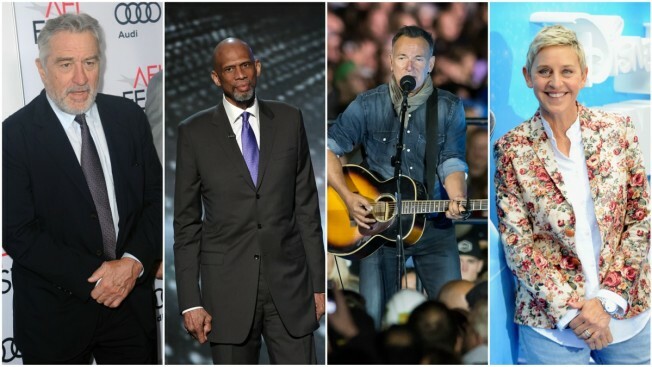 Robert De Niro, Kareem Abdul-Jabar, Bruce Springsteen and Ellen DeGeneres headline star-studded list of Presidential Medal of Freedom recipients. Robert De Niro, Michael Jordan, Bill and Melinda Gates, Tom Hanks, Ellen DeGeneres, Robert Redford, Bruce Springsteen and Lorne Michaels headline a star-studded list of honorees who will receive the Presidential Medal of Freedom, the country's highest civilian honor, the White House announced Wednesday. "The Presidential Medal of Freedom is not just our nation's highest civilian honor - it's a tribute to the idea that all of us, no matter where we come from, have the opportunity to change this country for the better," President Obama said in a release. "From scientists, philanthropists, and public servants to activists, athletes, and artists, these 21 individuals have helped push America forward, inspiring millions of people around the world along the way." The complete list of 21 names includes NBA Hall of Famer and activist Kareem Abdul-Jabbar, polymath physicist Richard Garwin, architect Frank Gehry, mathematician Margaret Hamilton, artist and designer Maya Lin, attorney Newt Minow, Miami Dade College president Eduardo Padron, singer Diana Ross, broadcaster Vin Scully and actress Cicely Tyson. Rear Admiral Grace Hopper and Blackfeet Tribal community leader Elouise Cobell will receive the award posthumously. The awards will be presented at the White House on Nov. 22. The event will be streamed live at: www.whitehouse.gov/live.